The double Grammy nominated Monk'estra big band lead by conductor/arranger and pianist John Beasley performed Sunday night in SFJAZZ's spacious Miner Auditorium. 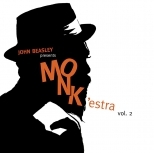 Released in September of this year, Beasley's Monk'estra Vol. 2 (Mack Avenue Records, 2017) had garnered some serious attention. This was also a special occasion commemorating Thelonious Monk's centennial and the audience was giddy with anticipation. Fans were treated to an inspiring session of Monk's classic songs reimagined and enlarged for orchestra. The impressive Monk'estra had taken part in the Monterey Jazz Festival's milestone 60th Anniversary a few weeks earlier (See my MJF60 review here and check out my fellow contributor Dave Kaufman's Monterey 2017 Sunday images here). Beasley had just flown in Sunday morning from his New York shows to prepare for the evening's performance, and was surprisingly energetic after the cross country flight. The sixteen member Monk'estra consisted of: leader Beasley; Trumpets-Bijon Watson, Jamie Hovorka, Rashawn Ross, Brian Swartz; Trombones-Ryan Dragon, Francisco Torres, Wendell Kelly, Lemar Guillary; Woodwinds-Bob Sheppard, Danny Janklow, Tom Luer, Tommy Peterson, Adam Schroeder; Bass-Ben Shepherd; Drums-Kendrick Scott. Songs for Monk's catalog included his signature "Epistrophy"; "Played Twice," "Ugly Beauty/Pannonica," "Skippy," "Criss Cross," "Light Blue," "Gallop's Gallop," "Ask Me Now," "Oska T," "Evidence," " 'Round Midnight" and "Brake's Sake." The prolific band leader's personal arrangements were an eye opener that showed his genuine appreciation and understanding of Monk's singular musical viewpoint. His Monk'estra captured the unconventional, quirky and playful nature of the celebrated pianist's original compositions, and provided generous space for Beasley's interpretations. During the concert, various members of Beasley's "collective" contributed resounding solos throughout the evening. Beasley also noted the cacophony of sounds and unexpected changes that made Monk's work unique. In one of the tracks, Beasley captured the ugly energy of street violence in the introduction and related it to the current Black Lives Matter movement. Susan, one of SFJAZZ's many patrons, provided her keen impressions of Monk'estra's provocative music. "When I came here, I thought of three things because I see a moment in my life and everything is very critical and changing. I see truth, integrity and I see spirit. I saw all of those things, and it's such a man's spirit. I saw a very sophisticated vision for how to put the music together, orchestrate the music in a very sophisticated way. I don't think it's easily relatable necessarily, but I think it's always interesting." These comments summed up the day's compelling presentation by John Beasley's Monk'estra. Beasley's Monk'estra set was a dazzling display of fresh interpretations scaled to take full advantage of his sixteen piece ensemble. The enlightening set closed with vigorous applause from the house. All About Jazz talked to John Beasley after the show and he shared his thoughts on the delightfully eccentric Monk. All About Jazz: What drew you to Thelonious Monk? 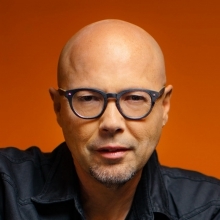 John Beasley: I'm not a paint-by-numbers person nor musician. When I was around 11 years old, my dad put on this Monk album called "Work" featuring Sonny Rollins on the stereo. I remember listening and laughing because his songs were catchy, whimsical, and mischievous. Monk wrote with such originality and put his witty personality into his writing and playing. He was hip to an 11 year old. His music didn't sound like what his peers were playing. He was an outlier. He faced a lot of criticism for his unique improvisational style, his singular musical vision, his crunchy dissonances, open spaces, intervallic jump, off- kilter rhythms, and disjunctive succession of phrases, but he wasn't looking for approval from anyone, not musicians, not the public, not critics. That's takes audacity. One hundred years later, Monk, like a lot of geniuses, he is more understood, appreciated, and celebrated. AAJ: How has Monk's work informed and developed your writing and outlook on life? JB: Monk gave me the courage to play what I hear in my head, which you can listen to in my albums MONK'estra Volume 1 and the sequel Volume 2. My arrangements are a sum of all of my musical and life experiences. AAJ: What are your favorite Monk compositions and why? JB: Well, that's a tough question. They all have there own personalities and character. A couple that I love that I have not arranged for MONK'estra are: "Reflections," "Monk's Dream," "Boo Boo's Birthday," "Off Minor" and "Trinkle Tinkle." AAJ: Thank you for sharing John and much success with the new album.